Here are five widely held beliefs about Black Friday, and why they need to go away. Myth No. 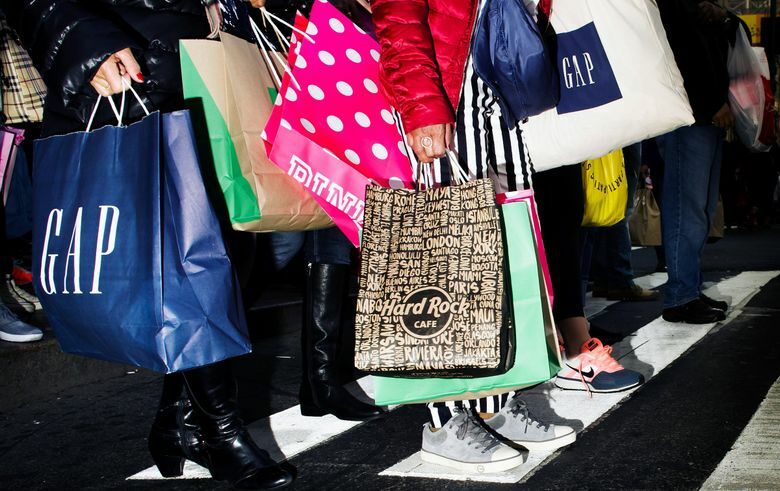 1: Shoppers can get the best deals of the year on Black Friday. About half of Americans shopped the weekend of Black Friday last year; in one survey, a third of consumers said they shop Black Friday to buy expensive items at a discount, and another third called it an opportunity to find deals not available any other time of the year. It’s true that some items can be found for less on Black Friday than any other day. Ana Serafin Smith of the National Retail Federation says customers will rarely see washers, dryers and big-screen TVs so heavily discounted. But the deals definitely do not extend to all merchandise. Companies use the “loss leader” approach on Black Friday — selling a few particular items at a loss to get people into the store on this day. “You buy one cheap item, and then you buy five items you don’t need at full price,” says Allen Adamson of New York University’s Stern School of Business. Adamson adds that shoppers often wrongly assume that everything is on sale. Retailers deploy tactics that can make Black Friday discounts seem better than they are: slightly increasing the regular price of an item in the days before the sale, for example, or selling lower-quality versions of an item, such as a television, made specifically for Black Friday. Myth No. 2: Black Friday is the best day of the year for businesses. With headlines proclaiming “Retailers hail Black Friday weekend as best ever” and “All Hail Black Friday: The Business Behind the Biggest Shopping Day of the Year,” it’s easy to believe the day’s revenue is the highest of the year for companies. One widely held origin story about the name “Black Friday” is that it’s the day that retailers see finances move out of the red and into the black. Myth No. 3: Customers resort to brawling to get the best merchandise. These Black Friday brawls, though, often have nothing to do with getting a deal, with getting the last piece of merchandise or with anything about Black Friday. Despite being described by the New York Post as “shoppers turned violent amid the annual buying frenzy,” two teenage girls who exchanged blows at a Buckle store in a Colorado mall were not fighting over merchandise, police said, but a personal matter. The newspaper went on to describe several shooting and stabbing incidents — which all took place in mall parking lots. The New York Daily News included a shooting outside a mall in Alexandria, La., in a story about Black Friday violence even while noting that “local authorities quickly determined the attack had nothing to do with Black Friday.” Scores of other “violent Black Friday” incidents were really about something else: parking spaces, for example, not a mad rush for the last Xbox. One reason customers aren’t fighting in large numbers over merchandise is that stores generally have plenty of stock to go around. “The possibility of a retailer running out of an item like a big-screen TV is usually slim to none,” Smith says. If it does happen, they give rain checks, she says. In addition, the majority of retailers have warehouse distribution centers where they store additional products, and they can get more items quickly. Myth No. 4: Many shoppers still line up before dawn for deals. Myth No 5: The web is killing Black Friday’s brick-and-mortar sales. “Black Friday is dying in the age of Amazon,” Business Insider declares, going on to quote a retail analyst who says “the whole idea and concept of Black Friday deals in store will diminish over time.” Indeed, 99 million people shopped in stores on Thanksgiving weekend in 2016, compared to 108 million who shopped online. As the number of shoppers setting foot in stores slips, online sales are on the rise, climbing from $3.34 billion in 2016 to $5 billion last year. But brick-and-mortar stores are far from dead. In a Bisnow survey on the future of Black Friday for brick-and-mortar retail, more than 30 experts laid out a more complex picture. They pointed to the enduring appeal of in-store shopping on Black Friday: It’s a ritual for many families and friends and a form of entertainment; stores offer ease of return that many online retailers do not; in-person shopping delivers an instant gratification that doesn’t translate on the web. In-store sales still win in several important categories, including clothing, which makes up more than 50 percent of all holiday purchases. Customers are used to seeing headlines about closing retail stores. But, as Ed Kennedy of Episerver puts it, “Ecommerce is not to blame for the ‘death of retail,’ because retail is not dead or dying.” What is clear is that the brick-and-mortar Black Friday shopping experience is changing – not disappearing.